Rugged and easy to install, these Chromalox ring heaters transfer heat by either conduction or convection to heat liquids, air, gases, and surfaces. 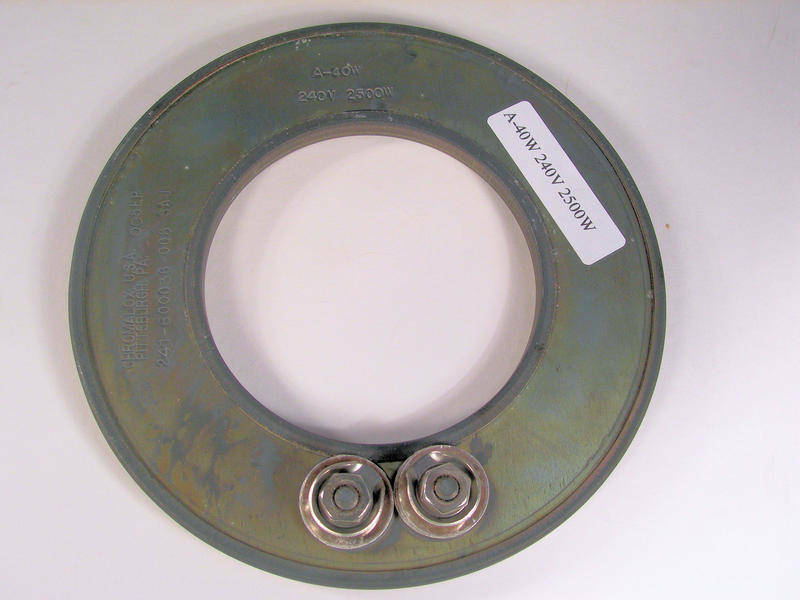 These single heat rings can be used in tank bottoms, pie dough presses, buffet tables, platens, dies, hot plates, glue and lead melting pots for drying, pre-heating, melting, baking, soup or food warming and curing applications. The heating rings bolt or clamp to many surfaces. Ring heaters can be nested to provide concentrated heat in small areas. Many sheath materials, termination styles, operating temperatures, sizes, voltages, wattage ratings, and mounting devices are available for these ring type heaters. Heaters are available in 120, 240, and other custom voltages. Jobco keeps many ring heaters in stock, and can get the Chromalox heaters you need. These are list prices, so call Jobco for quantity discounts available on ring heaters. Chromalox Ring Heater ( Pcn 241-600031-026) A-00 220 Volts 300 Watts 2-15/32" Od, 7/8" Id, 1/4" Thk, For Single Wattage On-off Switch Or Thermostat With Two Terminals--1-1/2" Wide By 17/32" Ht. Chromalox Ring Heater ( Pcn 135280) A-10 120 Volts 300 Watts 3" Od, 7/8" Id, 1/4" Thk, For Single Wattage On-off Switch Or Thermostat With Two Terminals--1-1/2" Wide By 17/32" Ht. Chromalox Ring Heater ( Pcn 135343) A-15w 240 Volts 350 Watts 3-1/2" Od, 7/8" Id, 1/4" Thk, For Single Wattage On-off Switch Or Thermostat With Two Terminals--1-1/2" Wide By 17/32" Ht. Chromalox Ring Heater ( Pcn 054547018) A-20w 120 Volts 1000 Watts 3-31/32" Od, 1-11/16" Id, 5/16" Thk, For Single Wattage On-off Switch Or Thermostat With Two Terminals--1-1/2" Wide By 17/32" Ht. Compare To Ht-10130. Chromalox Ring Heater ( Pcn 135351) A-20w 120 Volts 300 Watts 3-31/32" Od, 1-11/16" Id, 5/16" Thk, For Single Wattage On-off Switch Or Thermostat With Two Terminals--1-1/2" Wide By 17/32" Ht. Chromalox Ring Heater ( Pcn 207909) A-20w 240 Volts 2000 Watts 3-31/32" Od, 1-11/16" Id, 5/16" Thk, For Single Wattage On-off Switch Or Thermostat With Two Terminals--1-1/2" Wide By 17/32" Ht. Chromalox Ring Heater ( Pcn 198889) A-20w 240 Volts 750 Watts 3-31/32" Od, 1-11/16" Id, 5/16" Thk, For Single Wattage On-off Switch Or Thermostat With Two Terminals--1-1/2" Wide By 17/32" Ht. Ring Heaters A-40w 120 Volts 660 Watts (Pcn 135618) 5-7/16" Od, 3" Id, 5/16" Thk, For Single Wattage On-off Switch Or Thermostat With Two Terminals--1-1/2" Wide By 17/32" Ht. Ring Heaters A-40w 120 Volts 750 Watts (Pcn 135634) 5-7/16" Od, 3" Id, 5/16" Thk, For Single Wattage On-off Switch Or Thermostat With Two Terminals--1-1/2" Wide By 17/32" Ht. Ring Heater A-40w 240 Volts 500 Watts (Pcn 135600) 5-7/16" Od, 3" Id, 5/16" Thk, For Single Wattage On-off Switch Or Thermostat With Two Terminals--1-1/2" Wide By 17/32" Ht. Click on the form below for a list of Chromalox Single and Three Ring Heat ring heaters available to order from Jobco.